Parents and teachers may want to examine a diagram of a human heart for kids for many reasons. It can be used as part of a lesson plan at school. Parents of children who need heart surgery may want to show the diagram so that the child understands more about the procedure. For very young children, the best approach is to keep it simple. Choose a diagram that shows the heart from the outside and show another one that is a cross-section indicating the four chambers inside. If the child you want to share the diagram with is older, you can consider one that shows the four chambers of the heart, the valves and the veins and arteries that supply it. When you are looking for a diagram of a human heart for kids, the Internet has a number of resources available to you. Here are some examples of online resources. The WorldInvisible.com website has several diagrams of the human heart. 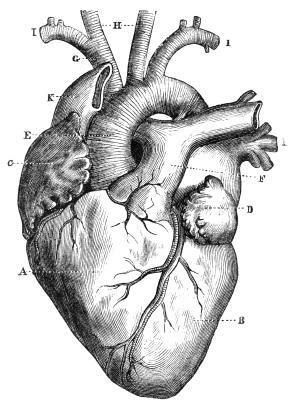 An image of the heart from the outside is provided, along with a cross-section showing the aorta, pulmonary vein, pulmonary artery, the septum, and the heart's valves. A diagram indicating the cardiac cycle is also provided, along with interesting facts about heart function, how much the ventricles put out with each beat, and how many times the average person's heart beats per minute. The Human Heart section of the Franklin Institute website includes diagrams and photographs, as well as tips on how to have a healthy heart, and a helpful glossary of terms. Teachers can find activities they can use in their classroom, and there is an image gallery on the site as well. The Texas Heart Institute at St. Luke's Episcopal Hospital offers a colorful diagram of a human heart. Diagrams of the heart valves and the human body's circulatory system are also provided. A detailed illustration of the conduction system is accompanied by an explanation of how the heart needs electrical impulses to beat properly. If you want to check out animated diagrams of the human heart, visit the Habits of the Heart website. Being able to see how the heart valves work and how blood flows through the heart helps to make these concepts clear to the viewer. This site also includes an image where the site visitor can choose to view the diagram with labels on or off and a page where they are invited to find a patient's heart using a virtual stethoscope. A diagram of a human heart for kids can be used for general information or to help children who are living with a health condition understand it better. Teachers can also use these images as part of their classroom teaching materials.